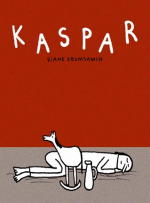 Kaspar, a graphic novel by Diane Obomsawin, tells the true story of Kaspar Hauser, a young man found on the streets of Nuremberg on May 18, 1828. Kaspar could barely walk or talk but held a letter "To the Captain of the 4th Squadron." Kaspar revealed to authorities that for as long as he could remember, he lived in a tiny cell without light or human interaction. He would become a controversial figure. Was he for real? A feral child or a convincing fraud? I had never heard of Kaspar before this book but apparently it was a famous case that inspired a number of books and movies. What I liked about the book was how it was told from Kaspar's point of view. It's obvious that Obomsawin takes the 'innocent' side of the argument from how she tells the story. The style of Kaspar is childlike. 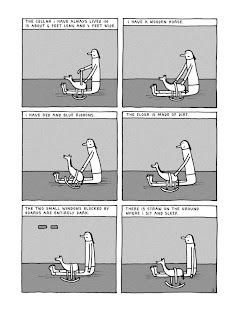 The drawings are very simple and the text has a sweetness to it. Seeing Kaspar with his little horse made me smile. Still, the story is for an older audience. There is an undertone of sadness. Kaspar was incredibly neglected and has no understanding of the world. Everything is new and confusing to him. I was worried for him, hoping that no one would hurt him. Although it's a short book, Obomsawin leaves room for the reader to fill in the blanks. I was left thinking a lot about Kaspar and whether his story was plausible or not. He supposedly had no contact with people until shortly before he was released, when he was taught to write his name. Later, he would write poetry and paint. So, it doesn't seem likely that he was telling the truth. Still, it's a fascinating idea. This is an English translation of a French Canadian work so it counts toward my Canadian Reading Challenge list. Thanks to my local library for having this on their shelves. How interesting, is the letter written by someone else then? Jodie- Supposedly, it was written by his captor. I've never heard of Kaspar either, but it certainly sounds like a fascinating case. I remember that Suzanne Vega had a song about Kaspar Hauser on her "Solitude Standing" album.